Mama’ s Little Baby Wants Shortenin’ Bread! I really should rename the subtitle of my blog “Food, Family and Friends”. 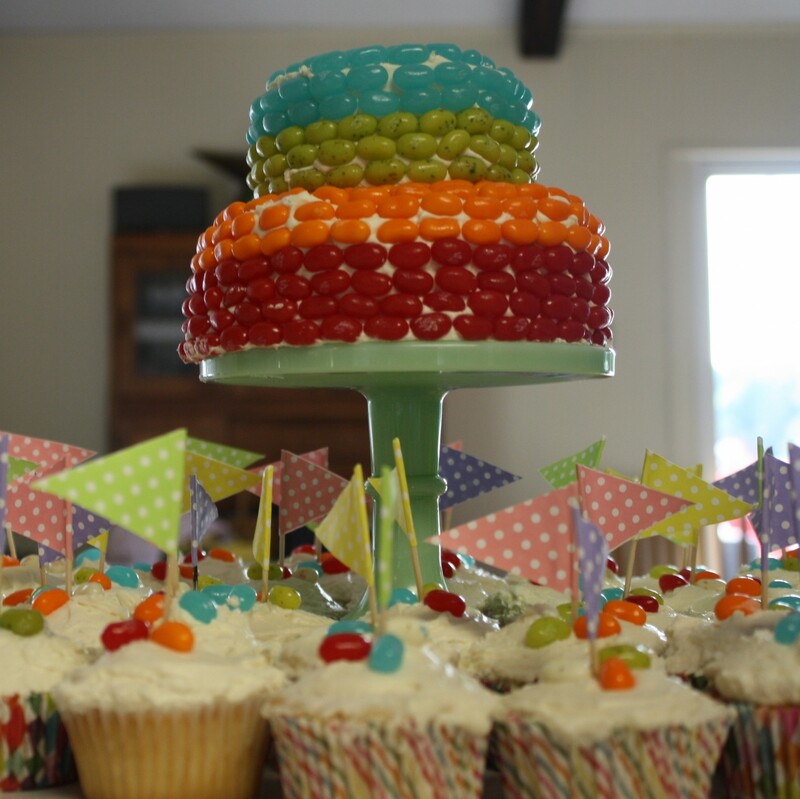 I can never bake, cook or create unless I think of wonderful memories and people. My friend Vanessa and I share a love of shortbread. We were both devastated when Panera Bread Company stopped baking their shortbread. They make a similar cookie, but now they frost it. Sorry, not the same thing. May Day May Day . . . But in a Good Way! Remember when you were in elementary school and would make May Baskets? Yeah, I’m old, my kids don’t remember that either. Every spring we would make May baskets to deliver to someone special on May 1. It was a whimsical little basket that usually was filled with a note, a chocolate or some other little treat. The deliver was suppose to be secret. You would hang it on someone’s door, ring the door bell and hide so they couldn’t see you when they opened their door and found their surprise. It was fun! I’m always looking for ways to stay connected to my grandbabies who live eight hours away. There is the phone, Facetime and all of those other electronic means of communication but I want to create memories with them. I will make them little cards and other little crafty things that they will remember getting in the mail from me. So today I created May baskets. Yes, I know at 2 1/2 years old and 8 months old they aren’t going to quite “get it”, but hopefully they will remember that their G thought about them and so so wanted to be a part of their lives. I don’t always make gourmet meals and follow laborious recipes. That’s right, some of my most successful meals are quick, easy to make and usually made with whatever I have in the refrigerator. Sometimes there is just not a lot in there! I guess my second confession is that I HATE HATE HATE going to the grocery store. I’d rather eat nails. Sometimes when I am alone I make popcorn casserole. Popcorn casserole is just regular old popcorn but by adding “casserole” it makes it sound healthier. Tonight was one of those nights. I have been gone for a week. I went to see my beautiful grandbabies in Wisconsin. I walked away from a refrigerator of fresh ingredients for my juicing. Turns out a week later—not so fresh. 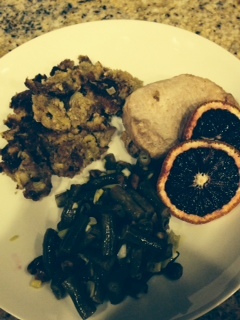 I didn’t want to waste them so I conjured up this menu: Pork chops and stuffing and a new green bean dish. My family would eat stuffing any day of the week for any meal. It has made a huge resurgence into our world this past winter. The experimental phase here came into play because I had very little of several kinds of bread. I had a ton of celery that was starting to get soft and as always lots of onions. I like one dish meals so I heated up a stove top casserole pan (Le Creuset, love of my life! ), melted butter and threw in a ton of thinly sliced celery and onions to sauté until soft. As they softened I added poultry seasoning, salt and pepper. As these cooked, I cut up the bread that I had. Don’t laugh and say “Oh no you didn’t,” because I Did. A slice of white bread (the heel), a plain bagel, 3 English muffins and some homemade coarse bread creams—oh and 2 hamburger buns and an onion bun. I added the bread mixture to the softened celery/onion mixture and some canned chicken stock until it was the texture I liked. I dotted the top with butter and threw it in the oven at 350 degrees. About 15 minutes later I topped the casserole dish with frozen, yes frozen pork chops and continued baking for about half an hour—uncovered. I’ve used this method for years and everyone thinks I have been slaving away for hours. Tonight new recipe however was the hum dinger. I had frozen green beans. I knew I needed to serve some veggies, but I also knew I needed a jazzy twist. So I nuked the frozen beans until they were unfrozen, drained the excess water and stuck them in the microwave again for about three minutes. In a small bow I added the juice of ½ lemon, some white vinegar and olive oil (a 2 to 1 ratio of acid to oil), salt, pepper and whisked to emulsify. To the green beans I added the vinaigrette and about a cup of chopped green onions—tops and all (also on their last legs in my refrigerator). Now, vinaigrette beans are not all that unusual—but to this I added about ½ a cup of salted, shelled pistachios and served at room temperature. It was the hit of the party. Cause really, shouldn’t every meal be a party? Oh the lengths I will go to avoid the grocery store! That’s the phrase I always use when explaining how good a recipe has turned out or in reference to my “keepers.” You might not know this but I am famous for my chocolate chip cookies. People beg for them. In my father’s later years he lived with us. It was a joy to have this totally capable, independent man live with us. He was a blessing to us. We were dependent on him not the other way around. A bit of a health freak he had a couple of weaknesses. One of them was chocolate — particularly chocolate chip cookies. That was probably where my search for the perfect recipe began. I had a chocolate chip cookie jar in the pantry. When it got low, low, not empty my dad would take a bag of chocolate chips (which we were never out of!) and set it on the counter. Just a little reminder that is was time to fire up the Kitchen Aid. All the kids, kids of all ages, who came to the house knew where two things were, Grandpa’s candy jar, full of M&M’s and the chocolate chip cookie jar. They’d walk in the door and look at an adult with knowing eyes, waiting for the nod to go ahead and help themselves. When grandpa died, the candy jar and cookies were at the funeral home during his visitation. It has been two years and I can’t get myself to put either away! Like any good recipe, you tweak. This chocolate chip cookie recipe is tweaked to the nth degree. If you try it, promise me you will follow the directions carefully–or just tell me you did. 1. Sift flours, baking soda, baking powder and salt into a bowl. I use a plastic Tupperware bowl with a lid so I can use it to store the completed dough in the refrigerator. Set aside. 2. Using a mixer fitted with paddle attachment, cream butter until it is light in color. Add sugars and beat for an additional 5 minutes. Add eggs, one at a time, mixing well after each addition. Stir in the vanilla. Reduce speed to low, add dry ingredients and mix until just combined, 5 to 10 seconds. 4. Using a large cookie scoop, scoop mounds of dough (the size of generous golf balls) onto baking sheet. Sprinkle lightly with sea salt and bake until golden brown, 18 to 20 minutes. Don’t over bake. Let cool on sheet for 5 minutes and move to a rack to cool. Doing so ensures that the cookies will remain crisp and not get soggy on the bottom. Makes about 2-2 1/2 dozen cookies. 1. I have frozen the dough in preformed scoops and stored them in a airtight container. I take them out a couple at a time and bake them when I want just a few warm ones to serve with ice cream on top. They taste good but don’t have the height that the unfrozen cookies do. 2. Refrigerating is essential with this recipe. This is not where you want to take a short cut. 3. Measure exact and follow directions. Things like sifting the flour, softening the butter make the difference between average and perfection!